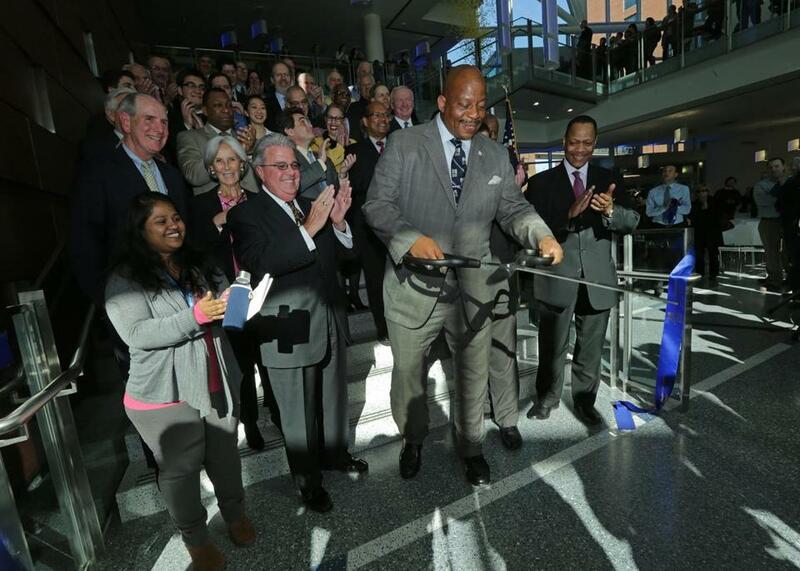 J. Keith Motley is shown at a ribbon-cutting ceremony in 2015. UMass Boston trustees have not renewed his contract. At UMass Boston, where officials are grappling with overdue construction projects, declining enrollment, and a looming $30 million deficit, there is frustration — particularly among black faculty — that chancellor J. Keith Motley is receiving too much blame for the campus’s problems. Several black professors say Motley has been made a scapegoat, even as they acknowledge the budget cuts he has ordered will hurt their programs. Leaders in the broader black community in Boston also say Motley plays an important role as the first black UMass chancellor and leader of the majority-minority campus. And many worry that university officials are trying to force him out. “He has made some mistakes; we all have. He deserves to stay,” said Barbara Lewis, director of the William Monroe Trotter Institute at the University of Massachusetts Boston, which studies black culture. Despite repeated warnings from the campus finance chief, UMass Boston has been unable to stem the flow of red ink — which has been compounded by a decline in fund-raising. The university trustees have not asked Motley to leave, but they have not renewed his contract, which expired in January. And the university system’s central office installed a first-ever deputy chancellor earlier this month to manage daily operations. Barry Mills, former president of Bowdoin College in Maine, is being paid $250,000 to run the school while Motley, who earned $422,000 last year, will remain its outward face. Professors say they are apprehensive about Mills and how he plans to divide power with Motley. “If this is about kind of ultimately taking away power, and doing an end-run game, and then making things so uncomfortable for Keith that he will quit, then I think that’s a dirty play,” said Cuf Ferguson, a professor of human services who has taught at UMass Boston since 1979. Even as many in the black community back Motley, they also worry about race relations on campus — as well as the future of black studies programs. That department has been ensnared in controversy this year after the longtime chairman was replaced and two female professors were denied tenure. Administrators have said the changes followed a review of the department’s academics, not finances. Van Der Meer and others question the leadership of the board of trustees, which approved the campus building projects and has a fiduciary duty to act in the best interest of the five-campus system. Board chairman Robert Manning did not return a request for comment for this story. Motley, who has been chancellor since 2007, ultimately answers to UMass system president Martin T. Meehan, who reports to the trustees. At least one trustee, Maria Furman, has expressed regret for not interceding on the Boston campus sooner. Motley did not respond to a request to be interviewed for this story. In a statement from Meehan’s office, spokesman Jeff Cournoyer said the central office interceded on the Boston campus simply because it was concerned about finances. It has worked with Motley in “close partnership with an open dialogue,” he said. “We have recognized and acknowledged the unique challenges facing the campus and the historical context in which some of those challenges arose, but our focus at this time is on the immediate fiscal issues,” the statement said. As with the entire system, the amount of state funding to UMass Boston has declined over the years, but the campus has also fallen short of its goals to raise more private dollars. Fund-raising, a key job for any college leader, has slipped in recent years. The university exceeded its fund-raising goals during the recession but has failed to meet them every year since 2010, according to data provided by the university. In fiscal 2016, the goal was $21.4 million, but the university raised just $10.5 million. Still, many believe Motley’s importance on campus can’t be measured in dollars. They point to a similar situation he faced in 2005 and to the similar show of support that ultimately won him the chancellorship. Back then, Ferguson, the human services professor, was among a group that rallied unsuccessfully for Motley to be appointed chancellor after he had served two years as interim chancellor. The board of trustees at that time opted instead for health care executive Michael F. Collins, who is white, igniting the fury of black and Latino state lawmakers and community leaders as well as students and professors, who hung “Let’s Keep Keith” signs around campus. Then-board chairman James J. Karam said Motley lacked the managerial experience that Collins had, but many saw the decision as a blow to a popular black leader. Some say today’s situation feels similar. “His ethnic affiliation very well may reduce the amount of support he is getting,” said Lewis, the director of the Trotter Institute, who said her program will hold fewer events this year and cut back on photocopying as a result of budget cuts. Motley continues to have strong support in the community, where black leaders said they are heartened by the school’s rise during his tenure. They see the financial problems as temporary and fixable, with the new buildings and heightened status of the city’s only public university everlasting. “When you grow up there and you see the new buildings, you have got to be impressed,” said Mel King, a longtime community activist, politician, and writer. Linda Dorcena Forry, a state senator whose district includes the campus, said for a long time it was considered nothing more than a little commuter school on a landfill. Tito Jackson, a Boston city councilor who is running for mayor, protested budget cuts last semester alongside students on campus. In an interview, Jackson said the community supports Motley, and he should remain chancellor. “Ultimately all of the responsibility is on the leadership, but I would also note that there is a board and there is a system connected to the school,” Jackson said. Jackson, who is black, declined to say whether he thinks race is a factor in the situation. While faculty and the larger Boston community zero in on the problems at UMass Boston, many students there have little time to worry about university politics in addition to their studies and busy lives. Claude-Olivier Prudent,19, of Boston, said many students aren’t aware of the changes going on in the administration but they know Motley and look up to him. Prudent, who studies political philosophy and is assistant coordinator of the black student center on campus, said some students don’t realize he is the chancellor, but they recognize the friendly administrator who smiles and waves to them on campus. “They do feel a connection to the chancellor. He is the only person they see that looks like them,” he said.